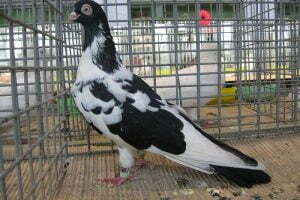 Apatin Tumbler ornamental pigeons – also known as: Culbutant d‘Apatin, Apatiner Tümmler, Capitombolante in Apatin, Апатинский турман – varieties of ornamental pigeons from the Apatian District, Serbia. I have not found information since when this variety began to be bred, but certainly it has spread to several countries in Europe. This variety is included in the TUMBLER type. The morphological characteristic is that the body is of medium size, with colors generally predominantly white, while the fontanel and tail are other colored (usually brown, beige or black). There is a crest on the nape of the neck, similar to mane, and feet generally without fur.